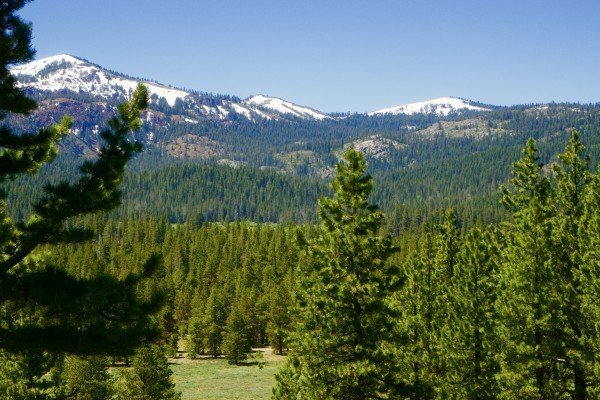 If you’re looking for a place to try out your new SUV and you like the feeling of being “way out there,” then you will love the Heness Pass Road near Lake Tahoe. Although the entire route extends from Marysville, California to Virginia City, Nevada, I love the middle third the best, especially in the summer heat. Heness Pass — just under 7,000 feet — is the lowest pass through the Sierras and was the only mountain pass linking the Nevada gold fields to the California gold fields. If you’ve ever been stuck on Donner Pass in traffic on your way to Lake Tahoe, imagine that traffic being a line of freight wagons (yeah, it was that busy day and night back then). The good news is that you’ll be lucky to pass two cars all day once you hit gravel. I went up there a week ago and almost died of loneliness! I might have if not for the incredible views and mountain lakes. It truly is a nice get away from the summer crowds and if you choose to camp along the way, you’ll have lots of spots to choose from. Getting there is pretty easy if you’ve ever been to Reno or Tahoe. Take Interstate 80 to Truckee and head north on HWY 89 for about 15 miles until you come to the Jackson Meadows Reservoir turnoff on the left (Little Truckee Summit). You have 18 miles of paved road to the dam until you hit gravel. As soon as you hit the dam, take a right and you’re on your way (don’t go across the dam). You’ll meander down the hill until you get to Milton Lake (a fly-fisherman’s dream). Stop and take a dip because you won’t get another chance for awhile. Past Milton Lake, you start climbing through beautiful thick trees on your way up to Heness pass. Along the pass you’ll have beautiful views of the Sierra Buttes to the north and endless southern views of the Gold Country. For the next couple of hours, you’ll slowly descend towards the mining town of Allegheny, home of the still active (and prosperous) Sixteen to One Mine. I would highly recommend picking up the Heness Pass Road Driving Tour brochure (available at any USFS office in the area). The brochure has a plethora of information on the rich history of the route and all the points of interest along the way. You could easily spend a week just visiting the various sites. Finally, when you least expect it, you’ll hit a beautiful paved road high above HWY 49. The next 15 or so miles will feel like heaven on your backside as you wind your way through one of the most beautiful forests around down to the little town of Camptonville. From here you can go right and end up in Nevada City, or left through Downieville (both incredibly beautiful) and eventually end up back in Truckee (make sure you look at the map before you decide). Most importantly, be prepared as parts of this ride are very remote and have no cell service. Although you don’t necessarily need a 4WD vehicle, I would highly recommend one. Summer thunderstorms and wrong turns can leave you in a mess of trouble. Bring plenty of water, food, and emergency gear just in case and make darn sure you have some tools and a spare tire. Stick to the main road (sometimes it’s hard to tell) and take your time over the rocky areas and you’ll make it just fine. Most of the side roads are in pretty good shape but make sure you have a good TOPO map of the area in case you get confused. Every time I take this route I discover something new. It truly is a great side trip and few folks spend the time exploring. I’d bring all your camping gear along because you’re apt to want to stay awhile. For more information including the history of the Heness Pass Road click here.